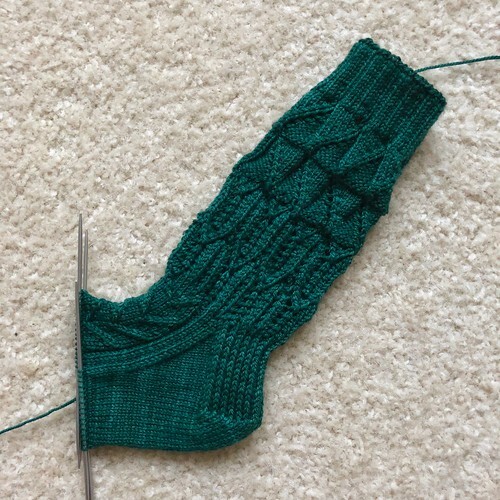 I'm still working on my first Dragon MKAL sock. The fourth and final clue was released Monday, but I've only knit through the third clue so far. 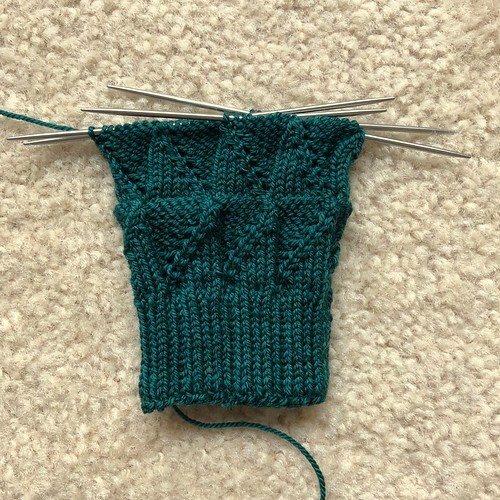 The second sock should be faster because I know exactly what I'm doing and I'm not waiting on clues to be released, so once I finish this first sock, I should finish the pair soon after. It's been a fun knit, seeing the different "dragon" stitch patterns, but I'm ready to finish them up. A couple of weeks ago, the Scintillation pattern was released and I bought it immediately. Unfortunately, I didn't have time to start knitting them immediately. When I finished my Ravello Five, I immediately cast on for a star with the leftover Hydroponic. I've now knit all three sizes of the five pointed star in stockinette stitch. Have at least an hour for starting. The cast on and beginning is a bit fiddly and you won't want to put it down during that time. The largest star is the easiest to make, so start there. 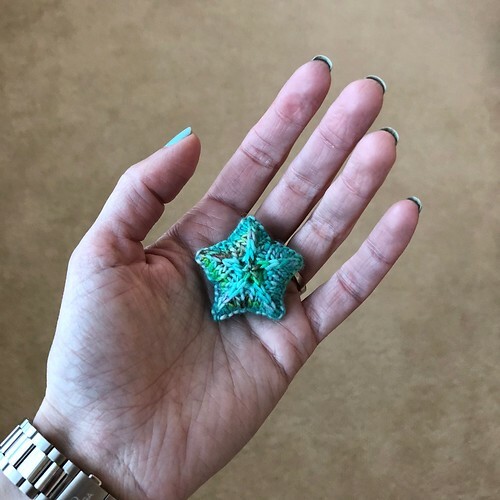 In addition to the fiddly beginning, the center of the star is also fiddly and the largest one gives you more to hold onto while you're knitting it. 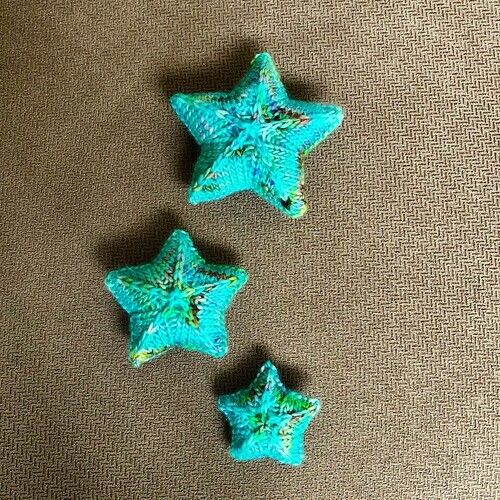 Once you figure out what's going on with your first star, the next stars are easier, faster, and slightly less fiddly. 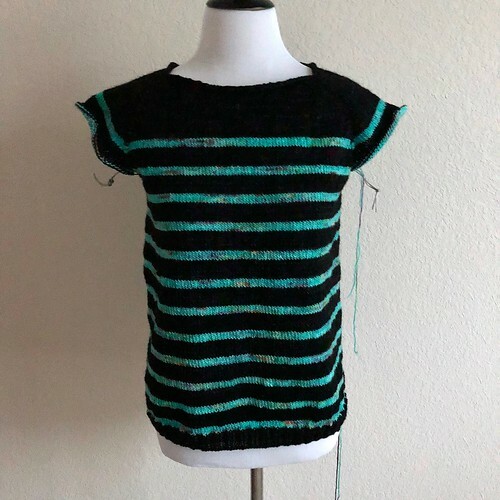 There's a KAL in the designer's group on Ravelry (that has more tips as well as emotional support if you need it), and if you were wondering, yes, this is the same designer who made the Palpitation heart pattern, and the Gripping tentacle pattern. She also has tons of accessory patterns that are just beautiful. 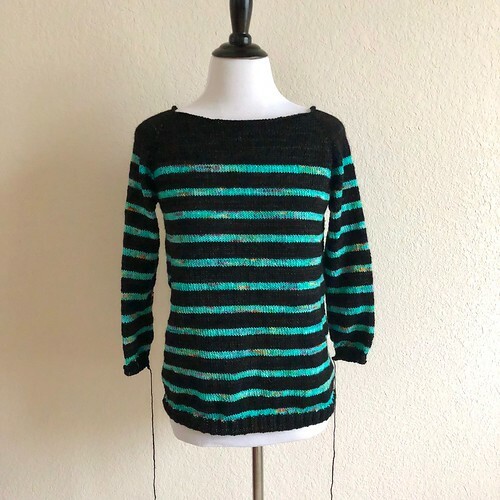 I've completely finished my fifth Ravello pullover! It's knit in Madelinetosh Tosh Merino Light in Onyx and Hydroponic. 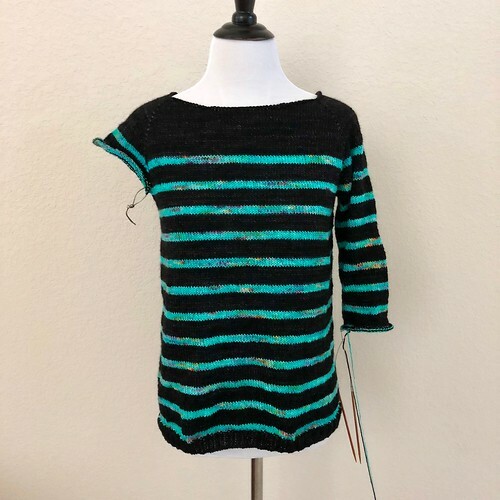 This is the first time I've done stripes all the way down but I really like it for a two color Ravello. After knitting five of these, there's not really a lot to say. Obviously, I like knitting this design and the finished pullover fits into my cold weather wardrobe really well. 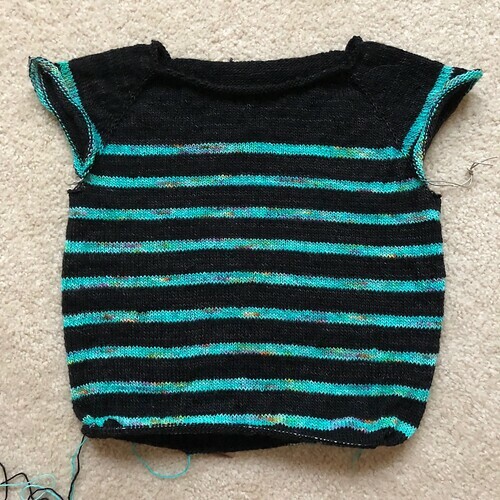 The only thing I did differently with this one (other than the stripe pattern) was to carry the yarns along as I worked. I just twisted the yarns at the first of every round so I wouldn't have to weave in so many ends. Once I figured out how to manage the twist and tension so things didn't get weird, it was much easier and faster than dealing with all those ends. It also saved yarn. Please don't ask how I managed tension, it was a lot of trial and error and I'm not really sure that I did it right. I have yarn for another one of these so maybe I can figure out what I did better on that one. Then I'll explain it if I can. I've finished both sleeves on my Ravello Five! All that's left is doing the neck edge and weaving in the ends. Then I'll steam block it and it will be ready for cooler weather. I hope to get it finished today. Once this is finished, and having finished the Space Mermaid wrap, I can cast on for something new. The problem is, I'm not sure what I want to cast on. It looks like I'm going to be doing some stash diving this weekend! I'm just about finished with the first sleeve of Ravello Five. It's on a longer needle in this picture because I had just tried it on. I knit sleeves on nine inch circulars, but they're too short to use when I try it on to check sleeve length unless I'm doing long sleeves. Anyway, I figured out where I was and how much more I need to knit on this first sleeve. The second sleeve always goes much faster because I don't have to stop and check lengths, I just knit the same number of rounds as the first sleeve. Once I've knit both sleeves, I just have to do the neck edge and block it and the sweater is finished. I'll probably do a simple single crochet edge at the neck like I've done before. It finishes the edge and keeps it from rolling without narrowing the neckline. I'm still working along on my second Relax pullover. There's nothing like knowing if I don't feel like knitting anything else, at least there's a large rectangle of stockinette I can work on. The fact that the yarn feels amazing is just icing on the cake! Have a great weekend and if you're dealing with Florence, stay safe! I finished the body of Ravello Five! I'm going to weave in ends before I start the sleeves, but I hope to get those started later this week. I don't have very many ends because I carried the yarns down the side instead of cutting them between stripes. This is the first time I've done it this way and it not only saves time, but also yarn, since I'm not giving up those few inches at the beginning and end of every stripe. 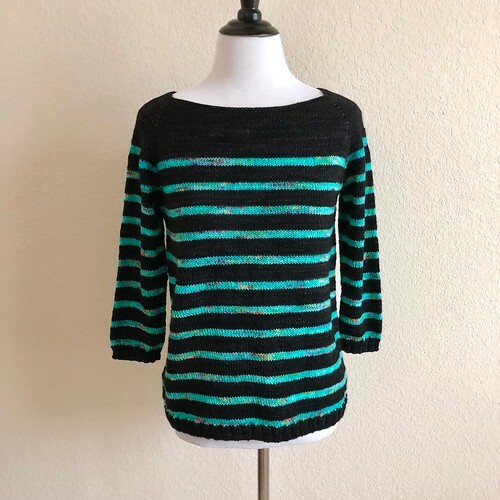 Those can add up on a stripy sweater like this one! 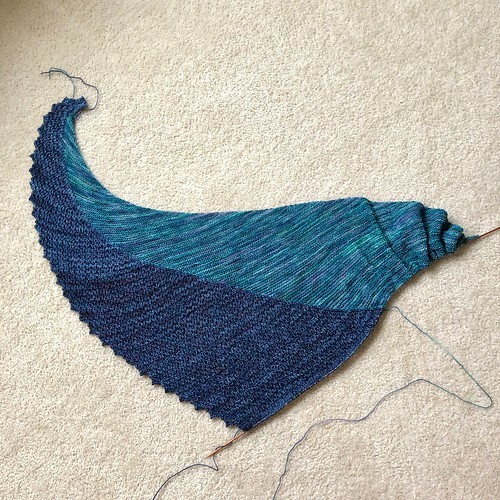 I also updated my notes on my Ravelry project page for the Space Mermaid to try to clarify how I did it with two colors. I think that with my notes and the original pattern, it should make sense now, but feel free to PM me (it's easier to reply directly on Ravelry than here on the blog) if there are any more questions. Last week the To Dragons With Love mystery sock began. I decided to play along because, dragons, and socks. I'm using Sweet Georgia Yarns Tough Love Sock (I know, again!) in Racing Green which is an absolutely gorgeous, rich green (slightly less blue than what the picture shows below). I'm calling them my Green Dragon socks. I've knit the first clue and since the second clue went out yesterday, I am going to show you what they look like. This is your warning if you're doing this MKAL, spoilers ahead! Turn back now if you don't want to see! Ok, so here's what I've got so far. I'm just doing one sock at a time because I don't want to divide the skein or work from both ends of the ball (that way madness lies). I really need to stash some more of this yarn since I not only love it, but I'm down to only one or two skeins now. I love the crazy, multicolored yarns for plain stockinette socks, but for patterns with more going on, I adore the tonal or almost solid yarns. 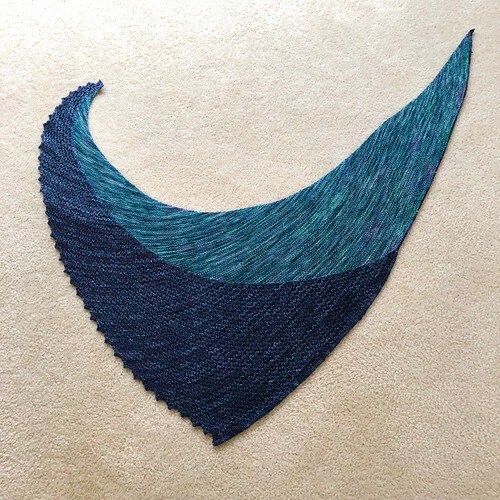 I finished my Space Mermaid shawl! 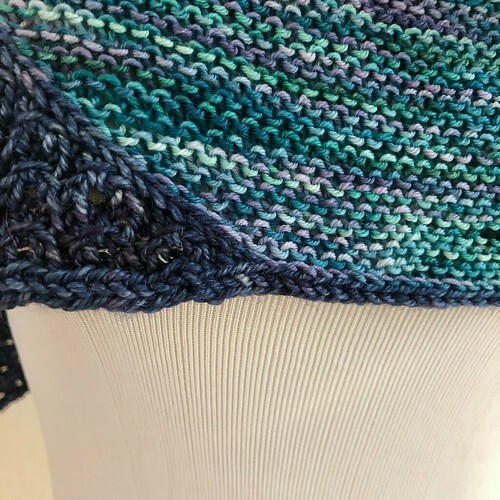 This is the Self-Acceptance shawl pattern, but I worked it in two colors (the pattern only uses one, I figured the two color variation out myself). Since I was working from two skeins, I was able to make it bigger also. I used two Eat.Sleep.Knit exclusive yarns since this was part of my submission for the Q3 KAL, based on exclusive colorways. The navy color is Squoosh Fiberarts Rapture in Planet 9 (from the 2016 space themed Yarnathon) and the multicolored green is Squoosh Fiberarts Beefcake Sock in Kelp Forest (from this year's Under the Sea Yarnathon). 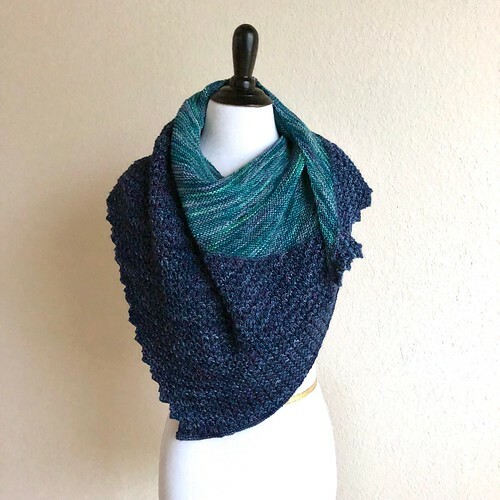 It was fun to watch the two yarns work together and I'm thrilled with the finished shawl. I decided to do an I-cord bind off using the Planet 9 to finish it off. I'm still working along on my Space Mermaid. 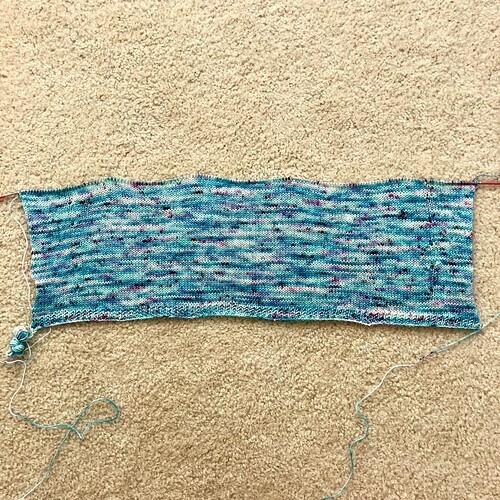 I've done three more repeats since you saw it earlier this week, but I realize it probably looks exactly the same to you. I can see the yarn balls getting smaller and smaller, but I probably have another three to five repeats before I'm done. I'm so close to getting this finished it's all I've been working on and I plan to continue through the weekend. At this point I'm wondering if I should have been photographing the yarn balls! I've got nine stripes now on Ravello Five. There are a few more inches to go in the body (so, a few more stripes) before it's finished. Then I'll move on to the sleeves. 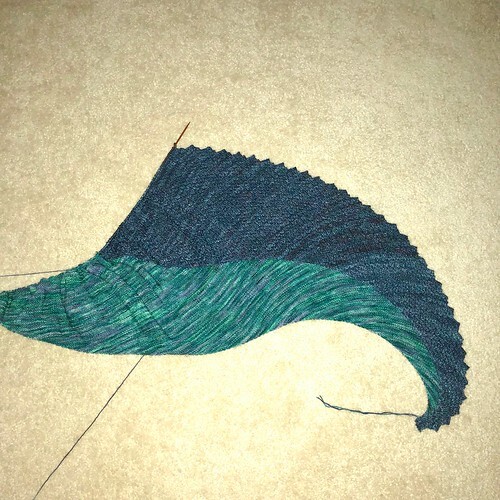 At this point, I'm confident that I'll only use one skein of the Hydroponic and less than two skeins of the Onyx. I might not completely use the full skein of Hydroponic, but I definitely won't dip into the second skein. This is good to know because I have an Aniversario/Natural combo in Malabrigo Mechita that I bought for this same sweater (yes, Ravello Six), and I bought the same amount of yarn. 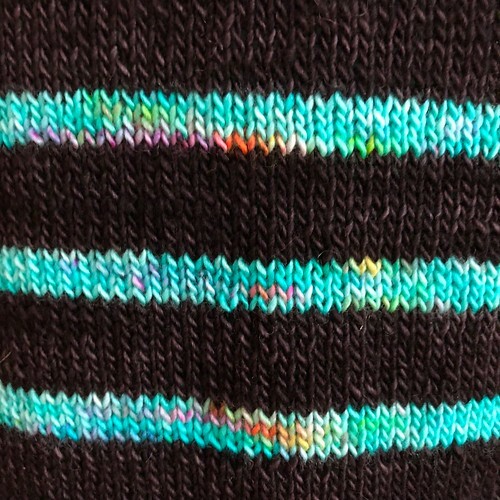 I like this striping sequence with the two colors so I'll definitely use it again for Ravello Six. Summer around here is now over. Homeschool starts today. Caleb and I are both dragging a bit this morning at the early wake up, but it's time to get back to learning. This is his senior year of high school and I have no idea how this happened. It seems like only yesterday that I was walking him to kindergarten and he talked to me the whole way. Walking to and from school was always an easy way to find out what was going on in Caleb's head. Now here he is, taller than I am, his voice is lower than Mickael's and he doesn't need help crossing the street anymore!